A pair of a canonical FunctionDecl and a SourceLocation. 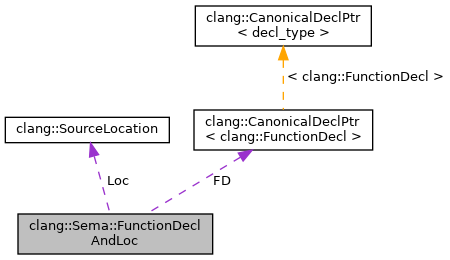 When used as the key in a hashtable, both the FD and location are hashed. Definition at line 10201 of file Sema.h. Definition at line 10202 of file Sema.h. Referenced by llvm::DenseMapInfo< clang::Sema::FunctionDeclAndLoc >::getHashValue(), and llvm::DenseMapInfo< clang::Sema::FunctionDeclAndLoc >::isEqual(). Definition at line 10203 of file Sema.h.